The Thames Tideway Tunnel is a major new sewer, urgently needed to protect the tidal River Thames from pollution. London’s sewerage system is no longer fit for purpose and spills millions of tonnes of sewage into the tidal section of the river every year. Tideway is building the tunnel to tackle the problem of overflows from the capital’s Victorian sewers for at least the next 100 years, and enable the UK to meet European environmental standards. Hammersmith Pumping Station is an existing Thames Water pumping station site. The proposed site covers the pumping station and part of the Fulham Reach development (currently under construction) and minor highway works. The site will be used to intercept the existing Hammersmith Pumping Station combined sewer overflow. 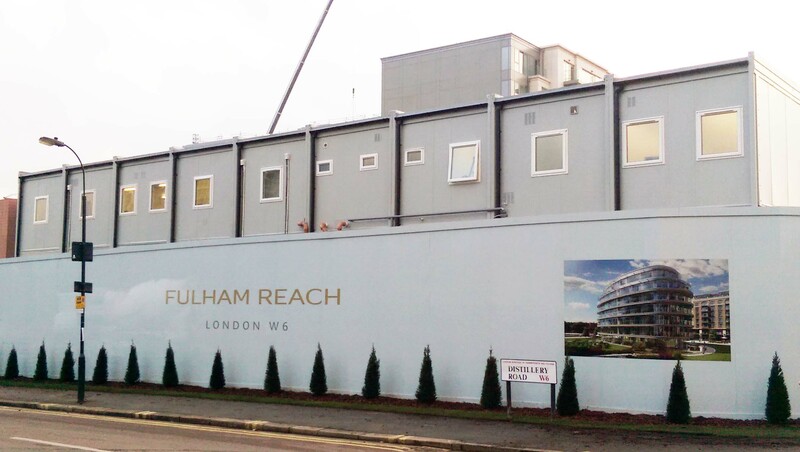 Premier Modular Ltd supplied a two storey office and welfare accommodation to the Hammersmith site for a period of 90 weeks using 18 modules from their hire fleet. The building provides changing and locker rooms, showers , toilets, induction room, canteen, first aid room, open plan offices and meeting rooms to be used during the construction works. Premier were awarded the contract due to time spent working with the client to realise cost effective solutions, the quick turnaround offered and due to their past experience of working within central London.